Roy Gillett’s body was so decomposed he had to be cremated because a casket couldn’t contain the smell, his heartbroken family says. The stench of his father’s body rotting inside a Toronto retirement home is still stuck in the back of Ricky Gillett’s throat. WE ALL THOUGHT OUR ELDERLY PARENT WAS OKAY! – in this case he lived a retirement village, he should have been found at least by the next day. Right? Keep reading to find out more. Could he have been found sooner? DEFINITELY YES, all it would have required would a daily check-in call by Care Calling Now so relatives or friends even the retirement village management would be notified should he have not answered our call. Responding to a call that his father had died, Gillett had just arrived at the Bill McMurray Residence. He stood in the lobby, perplexed to see body removal workers in protective white booties pushing a swollen body bag out of the home. He pressed the elevator button and stepped inside, riding it to his dad’s room on the third floor. The doors slid open and the lingering odour hit him. “I smelled something that I’ve never in my life smelled and I’ve never forgotten it — I could taste it. I can still taste it today,” Gillett said. A former sheet-metal worker and a devoted Toronto Maple Leafs fan, Roy Gillett, 82, had moved into Room 305 in January 2016 after a bad fall in his two-storey townhouse left him scared he’d get injured again or die alone, his body undiscovered. “That’s the great irony,” said his son, Gillett, 50. Roy was dead from a heart attack and in his bed for at least three days before his body was discovered on May 23, 2017, a Tuesday. His family believes it was five days, based on his last known sighting — dinner in the retirement home dining room on the previous Thursday, May 18 — as well as his cellphone log, which showed no outgoing calls since that Thursday, and the powerful odour that seeped from his room. The regulator that oversees Ontario’s 700 retirement homes said the fact that Roy never showed for meals in the home’s common dining area or called staff to say he would not be coming for lunch or dinner, for days, was a “red flag” that should have prompted a knock on his door. The retirement home said it did nothing wrong because its residents live independently and staff were not required to knock on Roy’s door. In a later email, the home said it has “reviewed our routines” and is now using weekly meetings to discuss ways to avoid similar incidents from happening again. “We are saddened by Mr. Gillett’s death and have expressed our condolences to the family,” said Bryce Taylor, executive director of the home and its operator, the Sionito Group of Charities. Gillett said his family is speaking publicly because they haven’t received a proper explanation from the retirement home or the Ontario coroner’s office. They are still trying to understand how an elderly man who was sent to a retirement home so he wouldn’t be left alone, ended up so badly decomposed that his body could only be cremated. A casket couldn’t contain the smell. Taylor said the “independent” seniors residence does not provide regular checks on residents. “We respect our residents’ privacy and support them to the extent we can when asked or when they take advantage of our programming,” he said in an email. Retirement homes are different from nursing homes. Residents have more freedom to come and go from their rental units but still have rules that must be followed. The Bill McMurray home, in west Toronto, caters to low-income seniors who had “psychiatric or addiction challenges combined with the frailties of aging,” according to its website. Roy lived on a pension and regularly drank beer, but his family said he moved into the home for one reason: to avoid falling while alone. The Bill McMurray home’s “code of conduct,” part of the “care information package agreement” that Roy signed with his lease, said he was required to inform staff if out of the building for “2 meals or longer.” It does not specify what the home would do if a resident simply stopped showing up or did not inform staff of two or more missed meals. “To be clear, no staff walked into his room. No staff knocked on his door. No staff opened the door to look into his room,” Taylor added. The autopsy found “advanced body decomposition.” The forensic pathologist gave a detailed description: “Putrefactive decomposition: bloating; foul odor; marbling; purging; skin slippage and vesiculation, green skin discolouration.” Translated, “skin slippage” means the skin slides off to the touch and “vesiculation” means fluid. Though the Gilletts pushed for the autopsy, coroner Dr. David Giddens, in his written report, filed Feb. 9, said the results would “likely not move the family any further ahead with their question as to why the body was not found for three days.” (The family said all clues point to five days, not three.) The coroner’s office did not investigate further. The issue, Gillett said, is not that their father died in bed from a heart attack, but that no one from the home checked on him before his body had turned into a mess. The other question is was if this person still alive immediately after his heart attack and if he had been found in the first 24 hour could have he possibly survived? Gillett still thinks there’s an important question that needs to be answered: “What if someone was stuck in their room and couldn’t ask for help? 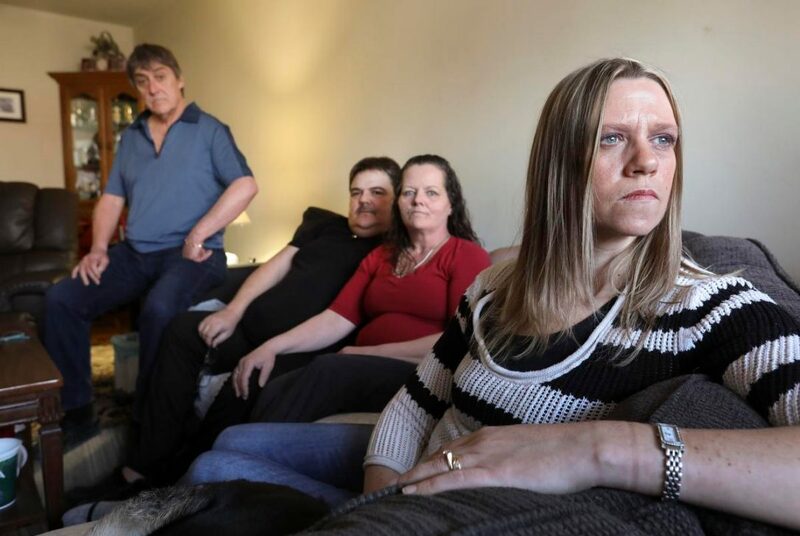 Would the home just leave them alone?”After Roy’s fall at his rented townhouse in the late of 2015, a staffer in the Toronto Community Care Access Centre recommended two possible retirement homes that would check on him. Roy’s eldest son, Bill, 57, was in charge. The first home was too “gloomy,” so he went to the Bill McMurray Residence, near Dundas and College Sts. Bill said the admission staff there told him — verbally — they would check on his dad every day. Residents like Roy receive a rent subsidy paid by the City of Toronto’s “Housing Connections” program. Roy’s monthly fees for his room started at $1,562, but the subsidy lowered it by roughly $300 a month. Roy paid the basic fee plus $20 a month for laundry service. His package included three meals a day plus an evening snack, visits from the home’s doctor, and weekly housekeeping. Residents can pay for extra help with bathing, dressing or hair care. Other retirement homes, charging significantly higher monthly rents, offer paid services of professionals like dentists and physiotherapists. Bill said he and his family visited their dad weekly, taking him snacks and cigarettes. He watched Roy call the office if he planned to miss a meal. “If he didn’t, they would call up and say, where are you?” Bill said. Roy’s children figure he had his heart attack sometime between his 5:30 p.m. retirement home dinner on May 18 and the late afternoon of May 19, when a fellow resident twice called Roy’s only phone, an old flip-style cell, to invite him for dinner in the home’s dining room. The phone log shows her calls came in at 6 p.m. and 6:10 p.m. on Friday. They went straight to voicemail, as if his battery was dead, said the fellow resident, a friend of Roy’s. She did not want her name used for fear that staff would be angry with her for speaking out. Taylor, the home’s spokesperson, said all residents are told they have the right to speak without fear of retribution. During an interview at a Tim Horton’s, near the retirement home, she described the discovery of Roy’s body, details that align with those provided by the home. On the Tuesday after the long weekend, she asked staff to check on him. She said two workers went up to his room and returned, looking grim. When Ricky Gillett’s wife, Helen, arrived with Roy’s smokes, as planned, in the early evening of Tuesday, May 23, Roy’s friend approached in the lobby. Another family member arrived a few minutes later. She said a doctor on the scene had asked the coroner to investigate because of fluid coming from Roy’s mouth. That evening, Ricky saw the body removal workers in the lobby. He said they first went up in street shoes but quickly came back downstairs to put on white booties. “That’s what got us really upset,” Gillett said. Gillett insisted on going upstairs to his dad’s room. He wanted to get his wallet and personal papers. Gillett said the receptionist told them not to go, but he pressed the elevator button, so the staffer rode up with him and his sister. When the doors opened, he was hit with an overpowering smell. Gillett stood at the doorway with his shirt over his face. Courtney ran in, holding her breath. She grabbed her dad’s wallet and papers before racing out of the room. Roy’s body went to a local funeral home. “They called us. They said you have to get the body cremated, we can’t keep it here — the smell is everywhere,” Gillett said. On advice of a family friend, a retired nurse, the family delayed cremation until the autopsy was done. Asked where Roy is now, Gillett’s wife, Helen said: “He’s here.” She hoisted a reusable tote bag in her dining room, emblazoned with the name “Newediuk Funeral Home.” It holds his urn, encased in a tightly taped cardboard box. 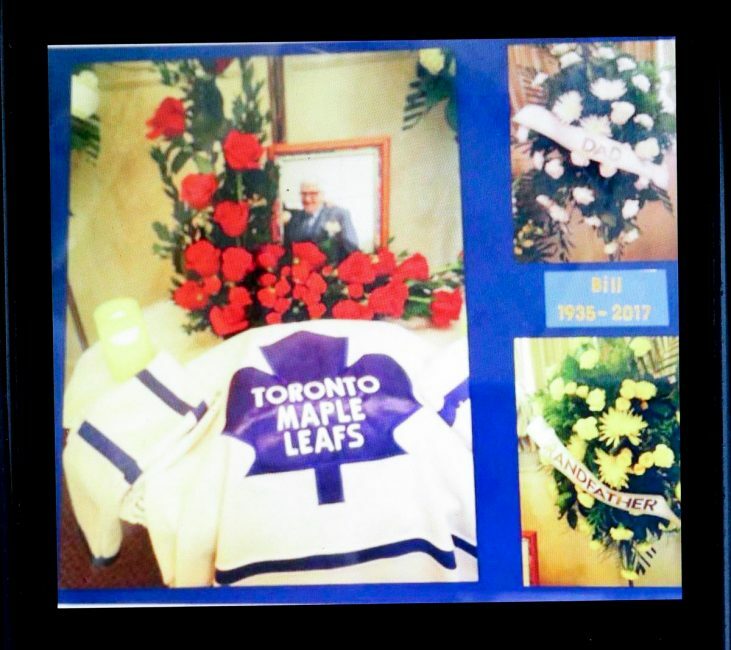 They’re still angry their dad’s body suffered the “indignity” of decomposition and couldn’t be given a proper funeral, dressed in his favourite Leaf’s jersey.